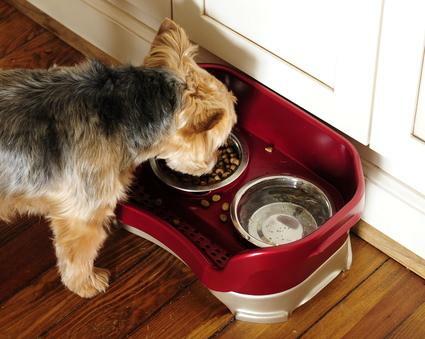 Dogs can be messy, but the Neater Feeder is a feeding station designed to keep your pet's food and water bowls from winding up spilled on the floor. Jacquelyn Becattini, Advertising and Marketing Director of Neater Feeder, shares product details in this interview. 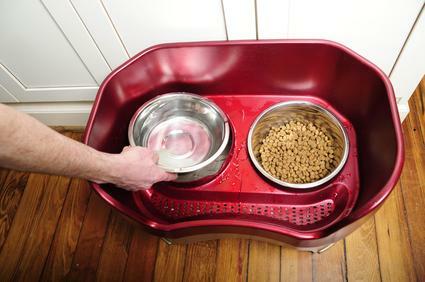 Tired of accidentally bumping your pet's food and water bowls and winding up with kibble and water all over the floor? So was Jacquelyn Becattini, so she decided there had to be a way to improve the situation. According to Jacquelyn, the main inspiration for the feeder's design came from her rescue dog, Duke. By the time she adopted Duke, he had already been returned to the rescue shelter several times because his previous owners found it difficult to deal with some of his less-than-desirable habits. One of Duke's worst habits was knocking over his water bowl and then laying in the puddle he made. As Jacquelyn tells it, "He created his own spa. So not only did the floors and everything around the bowls get wet, he would then be wet and go lay on the couch." The Neater Feeder is a complete feeding station for pets. According to Jacquelyn, "The Neater Feeder is a two part system that captures, contains and separates spilled food from spilled or slobbered water. Spilled food is trapped in the top tray where it can be safely reused. Spilled or slobbered water drains through the colander-like filtering system into the lower reservoir where it is safely stored and easily emptied. The design of the feeder protects walls and floors from stains, damage and messes. The feeding system also deters pests and helps save on food waste." The feeder's trays are made of durable plastic. When asked if the feeder was chew resistant, Jacquelyn replied that, "We have sold over 100,000 units, and so far none have come back chewed." The feeder can be used by dogs or cats. It comes in two colors, bronze or cranberry. It's available in four different sizes. Optional leg extensions are available to adjust the height of each size feeder. Cleaning the feeder is a straightforward task. According to Jacquelyn, "The entire unit is top-shelf dishwasher safe." Simply take the unit apart and run it through. If you don't happen to own a dishwasher, you can easily use a dishcloth or sponge to wash the feeder trays in warm, soapy water and rinse well. Dry the parts, reassemble the feeder, and you're ready to go. According to Jacquelyn, "Pricing on this feeder varies, depending on the size of the feeder selected and and whether or not the customer purchases optional leg extensions." The Neater Feeder website sells units for the following prices (base price without leg extensions), but be aware that prices are subject to change without notice. You can check the website directly for the most up-to-date pricing and shipping fees. If you'd like to look at the Neater Feeder in person to see if you like the design and whether you think this style of feeder would be a good fit for your pet, check your local pet supply shops because it is being carried at a growing number of retailers. Jacquelyn supplied the following list of retailers that currently sell the feeder, so you have the option to shop in person or online if you make a decision to purchase the unit. The company claims to stand behind their product. According to Jacquelyn, the Neater Feeder comes with a "100-percent, money back guarantee if a customer is not fully satisfied within 30 days of purchase." She went on to add, "Every store has their own return policy, so customers should check with the store where they purchased their feeder. We accept returns from our website and skymall within 30 days of purchase. Of course, if there were any quality issues with a feeder, we would work together with the company and customer to replace the feeder." Is This the Right Feeder for Your Pet? Overall, this feeder could save pet owners time they might otherwise spend cleaning up after their pets. If your dog is one of those canines who already eats and drinks reasonably neatly and you have her dishes placed in an out-of-the-way location where you never have to worry kicking them over, you're probably just as well off with your current bowls. On the other hand, if you have a messy dog like Jacquelyn's dog Duke or your bowls are located in a high-traffic area of your home, you'll likely find that the Neater Feeder offers an advantage over traditional food and water bowls.